The beauty is evident. Karst geology provides us with some of the best that nature has to offer: limestone caverns, stalactites and stalagmites on the inside and the magnificent irregularities of karst mountains and cliffs on the outside. The Dolomites in northern Italy are among the most famous examples. (There are a few "lesser Dolomites" in Campania, such as the Alburni massif.) One of the characteristics of karst landforms is that there is an extensive flow of underground water. That is where the beast comes in. Karst landforms are unstable over long periods of time. That big hole in the middle of the adjacent photo used to be all underground; part of it simply collapsed. (There is also a smaller collapsed grotto visible, center left.) That was a long time ago, but these days the slow calendars of geology and those of folks who build hotels and roads occasionally overlap. Then you've got problems. The area in the photo is along the Amalfi Drive (State Road 163) at a point 2.5 km (1.5 miles) from Amalfi (to the right in this photo). There are another 30 km or so to the left (SW) at water's edge along the western shore of the gulf of Salerno before 163 cuts up and over the peninsula and drops down onto the Sorrento plain on the Gulf of Naples. Most of the road along the Amalfi coast is similar to what you see here—spectacular and potentially dangerous. The Amalfi Drive passes directly above the prominent Hotel Saraceno (white building in the middle). If you had taken the turn-off on your way out from Amalfi about a mile back, you would have been on the panoramic state road 366 that climbs up and runs along where those buildings on top are situated. From sea-level up to those buildings is 200+meters (600+ feet); thus, that gaping grotto looks to be about 50 meters high. The entire coast is sprinkled with (I almost said “littered with”) beautiful hotels. They all cost an arm and a leg, but at least they'll be clean arms and legs, having been bathed and pampered in outdoor pools overlooking the cobalt blue of the Tyrrhenian Sea. Yes, it is that lovely. A special Commission appointed by the Campania Region in 2011 issued an alarming report (Relazione Generale Intervento n.10 della deliberazione CIPE n.8/2012 del 20.01.2012-Codice Istat 95 dell'Allegato 1 A.P.Q. Difesa Suolo). The report divides the entire Amalfi drive into three sections. The area in the photo is in section 3, from Conca dei Marini (the houses on top) and then the rest of the coast running back to Amalfi. All parts of the road have similar problems. Road 163 runs below sheer 100-meter-high karst cliffs that in places are so severely fractured that they are always in danger of collapsing...collapsing right onto the road and passing cars. That is the main concern. The situation below the road is less dramatic but dangerous nevertheless, as the photo on the left shows; that is, indeed, the relatively small slide that clipped the cute little tower at water's edge in the top photo a few years ago. There have been a half-dozen such slides since 2007. If you live up on top along the 366, well, nothing is going to fall on you, but you might fall on someone else. Yes, it is that dangerous. - knocking off loose bits. That really works, and in similar situations in smaller environments, can be quite effective. In some places, they even hire “rock knockers”—persons lowered down from above who then scramble along and poke down the loose pieces of rock. Most of the sections on the Amalfi Drive, however, would require large special cranes to do the job. - Various combinations of “ties” (that is, structural components designed to resist tension—straps, tie rods, eyebars, guy-wires, etc. Here, we note the importance of “natural ties” such as the great amount of vegetation along the 163, both cultivated as well as simple brush growing on slopes and even right out of the cracks in the cliff face (both kinds are evident in the large photo). Vegetation helps to control rain run-off and also "anchors" sections of the soil and rock in place, thus increasing the structural integrity of any given section of the road. Conversely, even a small brush fire in the wrong place will destroy vegetation and decrease that integrity. Thus, we are looking at a piece-by-piece solution—fit the solution to the particular problem at hand. As you move along the coast these days, there are always people juggling different little solutions to the problem. Let's hope that it's all part of a coordinated plan. When I took that photo at the top of page some years ago, I remember cracking wise about the “optimists who live up there on top of that hole.” Poor taste on my part, I admit. So, by all means, if you are one of those bathing and being pampered in your poolside paradise, enjoy it. On the other hand, if are driving the coast in the summer time, take the high road. If you are driving the low-road, forget the incompetence of other drivers and note the signs like the one shown here. Other drivers are the least of your problems. Addendum: (That is, I forgot...) I wondered aloud to friend and geologist, Peter H., if that big hole (above) had ever been at sea-level, maybe been a sea-grotto. 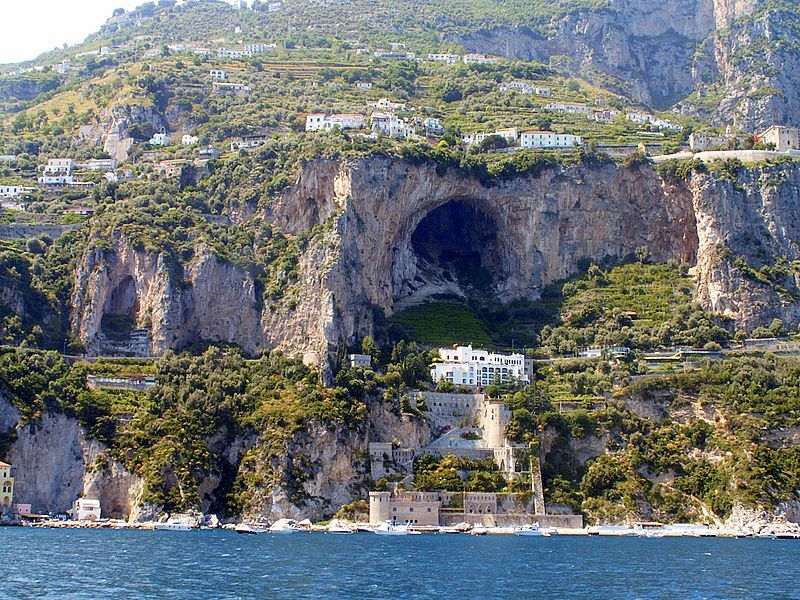 (We have a lot of those on the Tyrrhenian, one of the most famous of which is just a few yards off the left side of the photo —to wit, the so-called Emerald Grotto of Conca dei Marini; it is partially inundated with sea water, producing a cavern roof about 24 meters above water level. It produces spectacular colors and is one of the tourist attractions along the coast. Unlike many sea grottoes, there is no natural opening above the water line. You can't just duck your head while your faithful man-servant rows you through. You can scuba in, if they let you, or use the very unnatural elevator that will take you down from above.) Peter commented on the elevation of the large grotto in the photo and opined that it was more likely due to the fact the whole thing is sitting atop the major tectonic collision and crunch going on below, indeed the very one that produced (and is still producing) the Apennine mountain range that runs the length of Italy. It has a large number of local off-shoots on both sides. The one in the photo is called the Lattari range. (Most call it the "Sorrentine peninsula".) Note the word "tectonic". Right, I forget to mention earthquakes! Any rocky area subject to extreme fracturing anyway, as is the whole length of coast along the 163, is also subject to additional peril from earthquakes. Much of Italy is prone to quakes. The last "big one" in this area was 1980, the so-called "Irpinia Quake". It was a magnitude 6.9 centered in the province of Avellino at a point about 65 km/40 miles to the east of Amalfi. It was felt all over the area and certainly along the 163. This, just in case you needed something else to worry about.